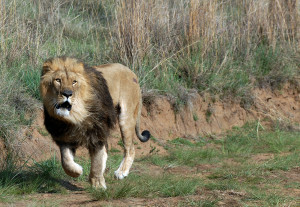 WASHINGTON D.C.––“Wild” African lions may in the future exist only as a species cultivated for trophy hunting, anticipates an October 29, 2014 U.S. Fish & Wildlife Service proposal to list them as a “threatened” species. Published in the October 29, 2014 edition of the Federal Register, the U.S. Fish & Wildlife Service notice of proposed rulemaking is open for 90 days of public comment, ending in January 2015, before taking effect. The listing proposal was hailed as a victory for the trophy hunting industry by Safari Club International, and was mourned as an at least partial defeat by the Humane Society of the U.S., Humane Society International, International Fund for Animal Welfare, Defenders of Wildlife, and Born Free USA, whose 2011 petition to the U.S. Fish & Wildlife Service initiated the “threatened” species listing process. This entry was posted in Lions by Purr and Roar. Bookmark the permalink.